Carlos Rene Pacheco is a photographer and artist originally from Tucson, Arizona. As a young astronomy student, he became disenchanted with applied physics and mathematics and exchanged his view through a telescope for a view through a camera lens. This was a transformational experience and he soon reconciled his passion for scientific exploration with his investigation of the photographic medium. Through this filter Pacheco explores issues of time, technology, and the photographic archive in his work. In 2011, Pacheco received his BFA with an emphasis in Photography from the University of Arizona in Tucson, and, in 2014, he received his MFA in Photography + Integrated Media from Ohio University in Athens. Pacheco currently resides in the Fargo-Moorhead area where he is in his third year as an Assistant Professor of Photography in the School of Art at Minnesota State University Moorhead in Moorhead, Minnesota. In addition to teaching, Pacheco continues to exhibit his work nationally on a regular basis. A few of Pacheco’s found photographs ready to be scanned. During my 24/2 residency I started on a larger body of work tentatively titled Artifact. 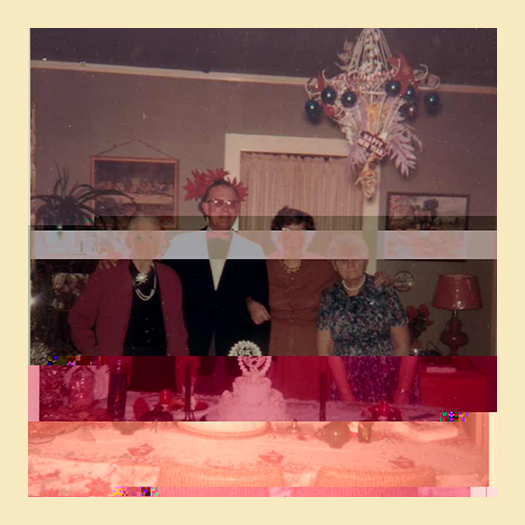 This project is an extension of some of my previous work involving found photographs and a glitch aesthetic. With the advent of digital technology came a de-materialization not only of ourselves but of the photographic medium. Photographs, which in the past were exclusively physical objects shared among friends and family, have been mostly replaced by virtual means of sharing through social media and online photo-streams. The physical photographs in this series, all specifically purchased through online auction sites are relics of a pre-virtual era filtered through this digital realm. Obtaining these memories no longer requires physical human interaction; they are obtained anonymously under the guise of a screen name. There is no physical transaction, no physical monies traded for these objects obtained through online transactions. A few clicks of a mouse and these objects are sent and received not unlike digital files via the internet. They are deconstructed, corrupted via an additive form of databending, and then reconstructed. In their final state, these new constructions, though they mirror their original form teeter between a state of physicality and virtuality. They exist as physical objects, but their contents have been distorted and their ability to pass on information has been cauterized. I proposed this project with the intention of using the time to scan and begin manipulating over 100 found photographs. Overland Artworks and the 24/2 residency was a good opportunity to show support for a unique approach to the traditional artist residency program while granting myself the mostly uninterrupted time to get some of my own work done. Most of the residency period was devoted to the time consuming process of creating high-resolution scans of the photographs in my new collection of images. Having this time allowed me to develop a system for archiving and manipulating the photographs at my disposal. This workflow eased some of the monotony of scanning such a large number of images. 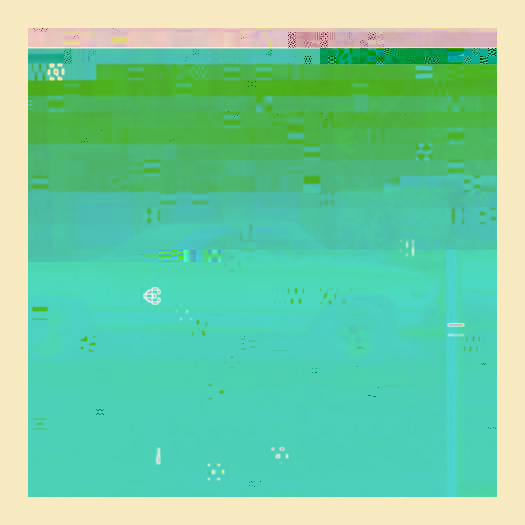 When the images were all scanned I was able to research and explore some different methods for glitching them. In the past I opened the digital files as text in a text editor and corrupted the code that way. With the time I had, I looked into different hex editors to use or my databending needs. The end results are ultimately similar, but provide a different way of looking at and manipulating the data that makes up the image files. How the data is laid out in a text file allows me “aim” my glitch effect. With a little exploration I can determine which section of text corresponds to a particular location in the image itself. In the end, I feel the overall residency experience was beneficial and enjoyable. I was able to stay relatively focused with few distractions aside from the occasional school-related email to respond to or the two curious cats wanting a closer look at the scanner.